Flip Out Mama: Melissa & Doug Terrific Twenty List and Giveaway! Well everyone, it's that time again! If you are looking for a great gift for your little one, you probably already know that Melissa & Doug are known for some of the greatest kid's toys on the planet! Well, now all you have to do to find the hottest kid's toys of the year is head over to Melissa & Doug's Facebook Page to enter to win a gift every single day from the Terrific Twenty list! If you've never gotten to experience the greatness that is Melissa & Doug, you are really missing out! They have some of the most durable, highest quality toys out there, and we love them here at our house! Now, if you are still interested in winning a great toy from Melissa And Doug, you can win one from us too! Melissa and Doug let us choose a great toy from the Terrific Twenty list to give away to one of our lucky readers! 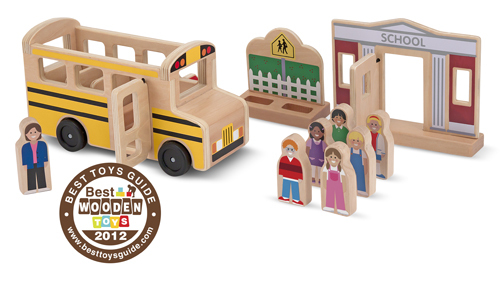 After much deliberation, we have chosen the Whittle World Wooden School Bus Set! We thought this would be a great toy for both boys and girls to play with, and it has enough pieces so that more than one child can play with it at a time! Do you want to win this adorable toy from Melissa And Doug's Terrific Twenty List? Leave a comment below telling us who you would share this great holiday toy with if you win! That's it, simple as that! Make sure to include your email address in the comments so we can contact you if you win! Contest will end on 11/16/2012 at approx 11pm est. Winner will be chosen via random.org and will have 48 hours to claim their prize or an alternate winner will be chosen. Sponsor is in charge of prize fulfillment. We will be provided with a product in exchange for this post, but all opinions and thoughts are my own. Have a great day and good luck! Would love to give this to my 3 year old son!